Heavenly blog! : No. 886: Member Cheated has probably more extensive in the Lutheran Church than it is in the Catholic Church over the last 20 years! No. 886: Member Cheated has probably more extensive in the Lutheran Church than it is in the Catholic Church over the last 20 years! Member Cheated has probably more extensive in the Lutheran Church than it is in the Catholic Church over the last 20 years! I defend in no way the Catholic Church and the bishop. But Nevertheless it, here are things turned head and bishops being long before there has been a judgment made as fraudulent and half criminal. And it is not just the secular newspapers but also day and Our Country's joining this kjøret. But those who have usurped most money through taxpayers is arguably the Lutheran church or state church in Norway. They have been, and that some vultures when they seek money, power and influence through arrangements and remains unbiblical. 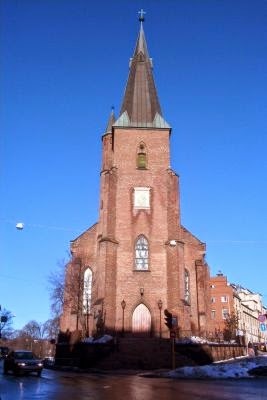 Photo of the St. Olav's Church (Catholic) in Oslo Akersgaten as I drive past many times a day. I am amazed at how great interest is the church all day and throughout the week. Had they received money for how many visited this church they had gotten far more money than what they are accused of having received irregular. Looks than other churches and the church here in Oslo, not least the Lutheran. So it is the opposite than the Catholic Church. Salute the Catholic Church that they are able to gather people to the house of God, whether they are members or not! Of all the arrangements, so really only deduction of tax to give to a church that one can defend. Member Money and money as the Norwegian State church receives to maintain baptisms, confirmations, weddings and funerals are really a cover for supplying money ?! The Norwegian State church received billions, for essentially maintaining an intuition. All this involves actually about four things: maintain baptisms, confirmations, weddings and funerals are the Norwegian state church billion in several ways. If it had not been for this, so did the Norwegian church really been discontinued long ago. It is only as an intuition it works. The Catholic Church is far more vital and alive than the Norwegian church! Here in Oslo city, so has the Norwegian state church worship services every Sunday, and few people show up there, except Christmas concerts and Christmas worship. Otherwise, the mostly dead. While the Catholic Church has fairs every day and worship several times on a Sunday. The emerging as vital and alive, unlike unfortunately most Protestant movements, churches and congregations. The Catholic Church can be compared to the Seamen's Church. I know and know of many who go in the Catholic Church, but who are not members. Should they then received money for them? Then they had gotten into the same as they are alleged to have received improper ?! Getting hope they get arrange this, but for me so would constitute a storm in a teacup. But getting money over tax bills without further ado, it always offers problems and difficulties! How is the Norwegian Church funded? They get money in spades by the state to maintain its offer. Not preaching of the gospel, but to maintain baptisms, confirmations, weddings and funerals! DNK has been scrutinized for this several times and it is stated several times that member registers contain very much mistaken. But unlike other religions and denominations shall not DNK support on the basis of membership of and it is therefore not talking about violations of criminal law in the same way as with the case of the Catholic Church. The latter has knowingly and manually registered members on the way to acquire more state aid than they are entitled to. It is fraud and embezzlement, while it bothers DNK are poor systems and incompetence. It is very difficult to get out of State church in Norway. This I have even learned. I had such. get my kids out there who have never been baptized children. It took me several years to get it. I was down in the office of pastor several times through a three years time to achieve this. Even after they had promised to delete my kids, so they stood listed there. Expect that no one in the family Christensen is enrolled in the Norwegian Church? But you never know? Here is the biggest and ugliest "wolf" at least out in the "free"! I hope really that money transferred from the state to churches being an end. There are routing, and something not found in God's word. The very best and the right that people voluntarily! The Norwegian State church gets money in abundance by the Norwegian government, a "robbery" is to be regarded as when I and probably millions of others give money to an intuition if we will or will not provide and maintain!